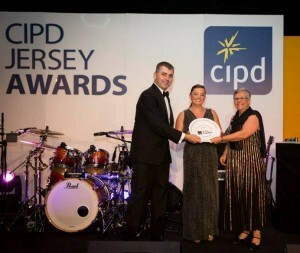 The winner of the “Jersey Water Award for Best Learning and Development Strategy”was announced on Saturday 18th October 2014 at the CIPD Jersey Branch Awards evening. Congratulations to The Channel Island Cooperative Society Limited and Connected Development who won overall. Helier Smith, Chief Operating Officer for Jersey Water, presenting the award toDonna Able FCIPD, Head of HR CI Co-operative Society Ltd, Sarah Merhet, Director, Connected Development.